Life is busy, what with the move, the job search, and the Starter Guide, but it’s unfair of me to hold off on these reviews any longer. So: a RAPID FIRE ROUND shall commence, where I give you my thoughts on the books I discovered at WisCon this May in a few hundred words each. I wasn’t able to purchase this book at WisCon proper, but I did see it in the dealer’s room and took note of it. I was especially interested in the setting after returning from Ghana. Chinua Achebe had passed away while I was on the same continent, which felt like an eerie coincidence to me–saying it that way sounds a little weird, because North American authors die while I’m sharing a continent with them all the time, but I’ve only been anywhere in Africa for two and a half weeks of my life, just in time to be there for the death of one of its most well-known authors. The good thing to come out of this sad event is I got to read the newspaper articles commemorating him (and pointing out that he’s not all that widely-read outside of schools), and once I returned to the American University library, I discovered 170+ volumes of the African Writers series that he edited. And I dove in. Once I returned to Wisconsin, I kept my eye out for more books by African writers or with African themes. 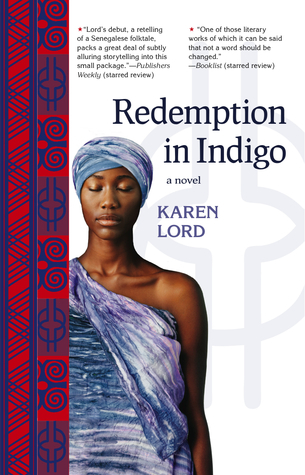 While the author, Karen Lord, is from the Carribbean (which of course doesn’t mean there are no cultural ties), Redemption in Indigo was inspired by a Senegalese folk tale, and the style strongly mimics an oral storytelling style. The Booklist review quoted on the cover: “One of those literary works of which it can be said that not a word should be changed,” may have unfairly primed me for this story. On the one hand, nothing makes me go “Aw, yeah?” like such an assertion, but on the other hand…Booklist may well be right. This story seems in some ways above criticism. Even when the reader’s suspension of disbelief is aroused or the plot takes a dissatisfying turn, Lord’s narrator is prepared to get very in-your-face to defend certain artistic decisions. Since this is for humorous effect rather than browbeating the reader into submission, I rather liked it. Or maybe I was just browbeaten. In more ways than one, Redemption in Indigo is masterfully told, with a light touch and clever awareness of archetypes it plays with. Unlikely coincidences (like the trouble Paama’s husband gets himself into, or the denouement of the romance between her sister and a poor poet) become perfectly logical in context, and to say they’re silly seems to be missing the point. I’ve seen at least one disgruntled Goodreads review comparing this story to Paul Coelho’s “new agey” writing, but more focused on storytelling than the lesson. I don’t think Redemption is supposed to have a lesson at all, and to expect one is to misunderstand it (I also feel like pointing out that Coelho is rarely shelved in the fantasy section, which is where I found Redemption; whether this is a credit to the “Sci Fi Ghetto” I leave for others to debate). It is, above all, a story. This doesn’t mean it lacks themes–including the power of choice, the failure of human foresight, the two combining into chaos, plus redemptive arcs (are you surprised?) for several characters, both human and nonhuman (now that surprised me!). And, insofar as it draws directly on the folklore style Coelho is attempting to recreate, I’d say Redemption got there first. Short and fast-paced, the story contains a multitude of very likeable characters, and even the less likeable ones–Paama’s obsessed husband and her selfish younger sister–grow sympathetic. Also, Redemption in Indigo is the first time I’ve ever seen a Trickster achetype have such a character arc. I’ll say no more about that, to avoid spoilers. But I will say, while Redemption’s mythic undertones make it feel like you should be able to predict the outcome, I was genuinely surprised by the ending. One character did seem to appear out of nowhere (or more properly, reappear–he’s there at the opening of the story and pretty much forgotten for the next hundred pages), to the point that I half expected him to be one of the supernatural djombi, too. I think that’s the only complaint I can make about the story’s construction. While you might be confused at the opening–the setting is modern, in a fictionalized African nation with deep traditional roots, so I was at first unsure of the time period until a character boarded a “five-hour omnibus with nothing more than a small suitcase and a bottle of antinausea, antacid chews” on page 16; and the talking spider is introduced with, as it happens, deliberate nonchalantness–you’re well advised to put your trust in Lord and her narrator (if not the talking spider) and watch the story unfold.